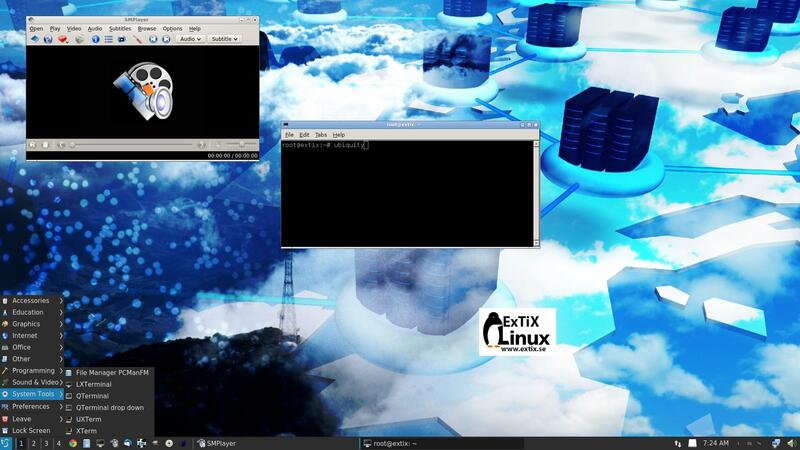 ExTiX Linux Live DVD’s 64 bit are based on Debian Jessie/Ubuntu 15.04. The original system includes the Desktop Environment Unity (Ubuntu). After removing Unity I have installed LXQt 0.9.0 (in ExTiX 15.2, build 150417) and KDE 4.14.6 together with KDE Frameworks 5.9.0 in an extra version also of 150417. LXQt is the Qt port and the upcoming version of LXDE, the Lightweight Desktop Environment. It is the product of the merge between the LXDE-Qt and the Razor-qt projects: A lightweight, modular, blazing-fast and user-friendly desktop environment. And KDE Frameworks are 60 addon libraries to Qt which provide a wide variety of commonly needed functionality in mature, peer reviewed and well tested libraries with friendly licensing terms. Ubuntu 15.04 will be released in a stable version 150423. Regardless of this fact you can consider both my ExTiX versions of 150417 as stable. The “Final Freeze” of Ubuntu 15.04 was yesterday (150416). My special kernel 3.19.0-14-exton corresponding Kernel.org’s kernel 3.19.3. 1. ExTiX (both versions) are now based on Ubuntu 15.04 Vivid Vervet. LXQt 0.9.0 (not in Ubuntu’s repositories) or KDE 4.14.6 with KDE Frameworks 5.9.0 are used as Desktop environments. All packages have been updated to the latest version by 150417 (LXQt version) and 150417 (KDE version). Kernel 3.19.0-14-exton is used. (Kernel.org‘s kernel 3.19.3). Ubuntu 15.04 to be relased 150423 will use kernel 3.19.0-14-generic. 2. Google Chrome is used as Web Browser, which makes it possible to watch Netflix movies. It is not possible in Firefox (in Linux). Both Firefox and Chrome are installed in the KDE version. 5. I have also installed Nvidia Graphic driver 346.59 in the LXQt version. It has support for the following GPUs: Quadro K1200, Quadro M6000, GeForce 920M, GeForce 930A, GeForce 930M, GeForce 940M, GeForce GTX 950M, GeForce GTX 960M and GeForce GTX TITAN X. This driver will be used automatically if your card is supported. Note: One reason for me to abandon Gnome 3.14 (which was used in the previous version of ExTiX) is that Gnome 3.14 won’t run together with Nvidia’s proprietary drivers. WHAT’S SO SPECIAL about ExTiX and especially the two new versions from 150417? 1. The ExTiX ISO’s are ISO-hybrids, which means that they can very easily be transferred (copied) to a USB pen drive. 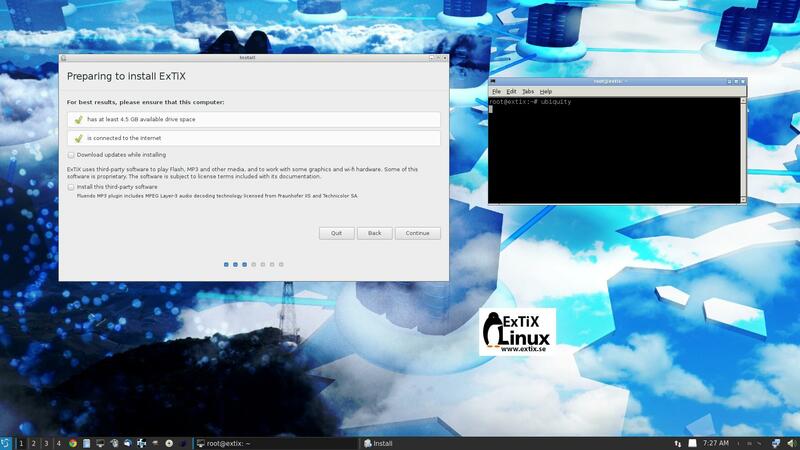 You can then even run ExTiX from the USB stick and save all your system changes on the stick. I.e. you will enjoy persistence! I’ve found two scripts which make the installation to USB very simple. My tests show that they work flawlessly on USB installations of all normal Ubuntu systems. 3. ExTiX is now more stable than ever. All packages have been upgraded to the latest version by 150417. 4. I’ve replaced kernel 3.18.0-10-exton with kernel 3.19.0-14-exton (Kernel.org‘s stable kernel 3.19.3) in both versions of ExTiX. 7. The installation program Ubiquity (live installer) is now working as intended. I.e. a new user (your user) will be created during the installation process. You can only run ExTiX live as root. Log in from Slim‘s Login Manager as root with password root in the LXQt version. 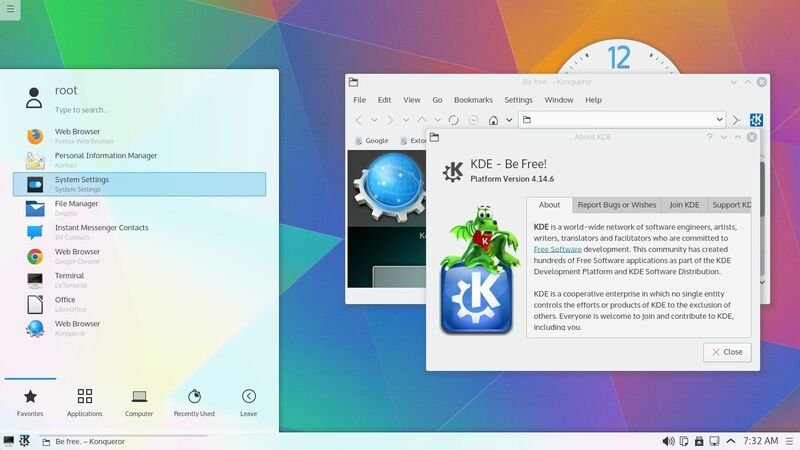 Or as regards the KDE version; from console mode. Run startx to enter X/KDE. Press Ctrl Alt F1 if you don’t end up in console mode after the boot process. During a hard drive installation you will get the opportunity to create a normal user. In the KDE version just start the install program Ubiquity from the menu (Install ExTiX 15.2). In the LXQt version you’ll have to start up a terminal and run the command ubiquity for the installation to start. Then just follow the instructions. A general truth: If an original system can run on a particular computer an Exton remaster of the same original system can run on the same computer. I never change a Linux system for the worse in terms of auto configuration and hardware detection, etc. It happens that I replace the original kernel, but always to a “better” one with even more native support for various hardware etc. (Which I have done in this case). Please note again that you can only log in to both Desktop Environments (LXQt and KDE) as root with password root. ALSO: If you don’t end up in console mode in the KDE edition you must press Ctrl Alt F1 simultaneously to get a login prompt. When you have it log in as root and run the command startx to enter X/KDE. DOWNLOAD ExTiX 15.2 (both versions) from SourceForge.net – Fast, secure and free downloads from the largest Open Source applications and software directory. How do you mean “don’t work? Do you get error messages or what? I have / and /home in different partitions. Well, reinstall and install everything on one partition then. I always do that myself with every Linux distro. You got med worried so I did a test installation. I get no errors. I wonder what you do? « Run Android-x86 from a USB stick with persistence!